Everyone knows “The Husky Song,” right? Well, not this one. Not unless you were at the University between 1940 and the mid-1950s. Because the song referred to in the 1940 Nutmeg is not the song you think it is. What is now known as “The Husky Fight Song,” actually titled “UConn Husky,” was written sometime in the late 1940s by Herbert France, who started the music department. But that’s getting ahead of the story. It was in 1939 that Connecticut State College became the University of Connecticut. Although the Husky had been the mascot since 1934 – after Connecticut Agricultural College became CSC and the nickname Aggies no longer applied to our athletic teams – the use of “UConn” didn’t become widespread until the 1940s. On the opposite page is the first pairing of the name with that of the mascot, where a sportswriter mentioned the “U-Conn Huskies” in a story on a varsity football game against the University of Buffalo. At that time, the usage typically was with a hyphen, either U-Conn or U-conn, a practice that continued into the 1960s. In the late summer of 1939, entreprenuer Fred Waring launched a new feature on his National Broadcasting Company (NBC) radio program. Fred Waring and Pennsylvanians was a well known big band of the era, and Waring had invested in the household invention that became known as the Waring Blender. One of the people who took Waring up on his offer to write more collegiate songs, was Tom Leonard, a junior from Waterbury and managing editor of the Connecticut Campus. Waring agreed. And on November 24, 1939, he premiered “The Connecticut Husky,” subtitled “The Mascot Song,” the fifth in his series of college songs. A contingent of about 30 students, faculty and alumni attended the live, 7 p.m. broadcast of “Pleasure Time” in New York. “Thrilled to the words, ‘Fight, fight, fight, Connecticut, fight’, hundreds of loyal Connecticut rooters glowed with satisfaction last Friday night as Fred Waring and his Pennsylvanians introduced their Connecticut fight song, ‘The Connecticut Husky,'” reported the Campus on November 28, 1939. “Equally eager to be ‘in’ on the first playing of what will undoubtedly take its place as one of our leading college songs, hundreds on campus bent an ear to their radios at the appointed time,” the Campus continued. For more than a decade, the song was “one of our leading songs.” The words, possibly written by Pat Ballard, who is credited with Waring for the composition, were published each year in the student handbook from 1940 until 1953. Then it slipped into oblivion. What took its place is the familiar “UConn Husky,” which first showed up in the handbook, along with the Waring tune, in 1949-50. 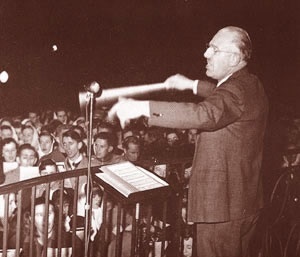 “UConn Husky” was written by Herbert A. France of Coventry, who joined the staff of Connecticut Agricultural College in 1931 to start up the music department and lead campus choral groups. He was department head until 1949, and retired in 1960. He died in 1971, and in 1981, at the University’s centennial, his family gave UConn the rights to the song. The current arrangement of France’s “UConn Husky,” as played by the UConn Marching Band, is an adaptation by David Maker, professor of music, of an earlier arrangement by Jerry Bilik. U Conn Husky, symbol of might to the foe. So go, go, go Connecticut, Connecticut U. Fight! Then standing proud– and loud—we’ll cheer our UConn Huskies evermore. Which inspires our college days. Our steadfast spirit of loyalty. Our fairest White and Blue. In our memories will cling. Want more? Learn all about the history of The University of Connecticut.